Responsibilities include caring for and maintaining the health and well being of all students, providing daily medical procedures, medications, and/or attending field trips. Use a thermometer to accurately measure body temperature, not the back of your hand. Body temperature is lowest upon waking and gradually increases throughout the day, so 4-5pm is a good time to check for fever. If your child wakes with a headache, a fever may be present; check temperature. Waking to a headache is a good indicator of sickness for children. Wash hands before eating and after using toilet. Do not share food, eating utensils or drinks with family members who are sick. if you are not able to stay home with your sick child, please have a back-up plan ready to avoid sending a sick child to school. Mandatory vision screening is performed at your child's school for grades K-5, grade 8 and grade 10. You will be notified in the mail if your child does not pass the screening. Please have the notice filled out by your eye doctor and return to your school nurse. 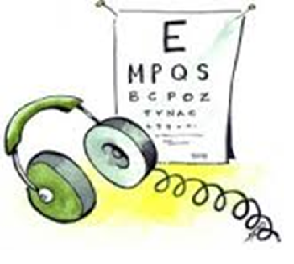 Mandatory hearing screening is performed yearly at your child's school for grades K-3, grade 8 and grade 10. If you receive a letter in the mail, please have your child's physician fill it out and return to the school nurse. Optimal learning requires good emotional and physical health. Chicopee Public Schools Health Services works together with families and the community for children’s health. The School Nurse at each school works with the school administrator to provide an environment that promotes optimal wellness and safety for all students. The School Nurse provides individualized quality health care for students, emphasizes health education at all levels and utilizes available community and school resources to promote an overall healthy lifestyle for students, staff, and families. > Acting as a special education team member for children with special needs.